IGL Ecoshine Leather is a unique, all-natural pH-balanced, leather cleaner and conditioner perfect for all leather surfaces in your car’s interior. Using plant-based emollients and natural conditioning agents that gently lift contaminants from your leather’s pores, IGL Ecoshine Leather is eco-friendly, easy-to-use, and provides instantaneous results! 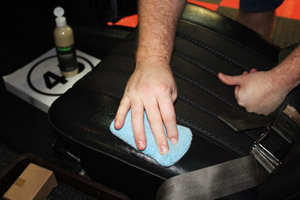 For “naturally” cleaned and conditioned leather surfaces, IGL Ecoshine Leather is just what you need! The interior of your car takes a beating – and no surface more than that of your seats; especially when they’re leather! Leather seats are prone to staining, fading, drying, cracking, and more when not properly maintained. Using a specially formulated leather cleaner and conditioner keeps your leather looking it’s best – and IGL Ecoshine Leather is just that! Use gentle plant-based emollients to condition your leather surfaces! Rather than using animal-based cleaner and conditioner like mink oil, IGL Ecoshine Leather uses plant-based emollients to gently clean and condition leather surfaces. These specialized ingredients work to naturally rid your leather of contaminants while also applying a soothing layer of conditioner. The VOC-free formula is safe for use on interior surfaces and does not leave a sticky, tacky layer behind! Keep your leather cleaned and conditioned, while also leaving behind a nice, fresh scent of fruity essentials oils, by using IGL Ecoshine Leather – the VOC-free, plant-based leather cleaner and conditioner! 2. Shake bottle well and apply onto a soft towel. 3. Gently rub towel in a circular motion. 4. Buff immediately with a second cloth. IGL Pro Tip: Test first on an inconspicuous area to test for colorfastness. Not for use on suede.